Rock Paper Lizard: On the wing. Meadowhawks and skimmers pause and sit. Darners do not, they go go go. But at least they go back and forth, so you need only stand in one place to take a shot, or many shots. 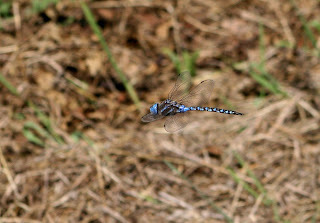 Digital SLRs conquer dragonfly evasiveness. Still think it is amazing you got this picture ... even with the repeat shot feature! Agreed, I've been trying to photograph dragonflies since I got my SLR a year ago - albeit without too much discipline - and haven't been able to get anything as beautiful as your photo! wonderful shot...I have to wait for everything to land or sit still.